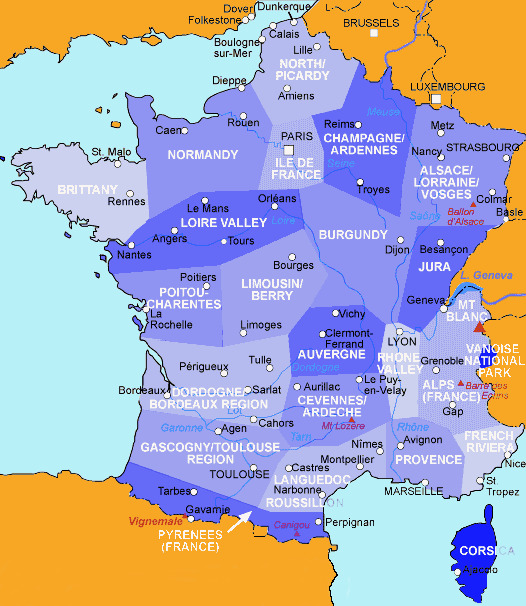 Topographic survey of France at 1:25,000 in IGN's excellent TOP25 / Série Bleue series. All the maps are GPS compatible, with a 1km UTM grid plus latitude and longitude lines at 5’ intervals. Contours are at 5m intervals except for mountainous areas where the maps have contours at 10m intervals, vividly enhanced by hill shading and graphics for rocky terrain. Colouring with graphics indicates different types of vegetation or land use (deciduous or coniferous forests, moors, orchards, vineyards, etc). 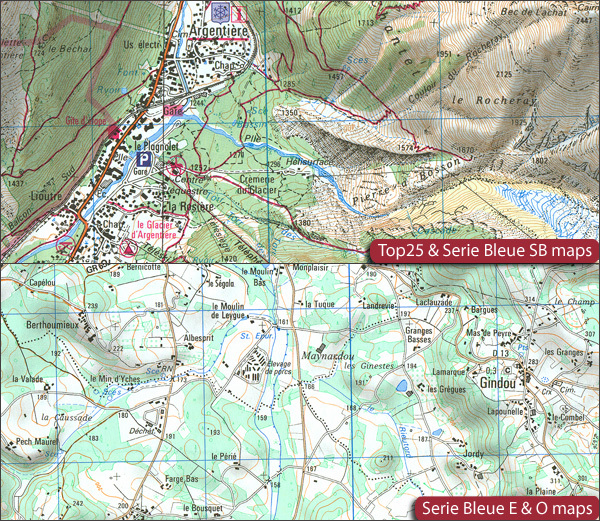 MAPS WITH FULL TOURIST OVERPRINT & AN ENGLISH MAP LEGEND: all TOP25 maps and the SB editions of Série Bleue have an overprint highlighting waymarked walking trails including long-distance GR routes and, where appropriate, ski routes. Symbols indicate campsites, gîtes d’etape, refuges, equestrian centres and other recreational facilities or sites, tourist information centres, cultural heritage, etc. Towns and locations of particular interest are highlighted. - ET or OT = single-sided TOP25 map covering approx. 29x21 km / 18x13 miles. - ETR or OTR = waterproof and tear resistant TOP25 map covering the same area as the corresponding ET or OT number, but double-sided, printed on a smaller size sheet with a good overlap between the sides. - SB = Série Bleue map with full tourist overprint; these maps, first introduced in summer 2014, each cover approx. 29x24km / 18x15 miles. SÉRIE BLEUE maps with numbers ending in E (Est) or O (Ouest): most editions now indicate the GR routes, but do not show any other tourist information. Map legend is in French only. Each map covers approx. 14x20km / 9x12 miles.